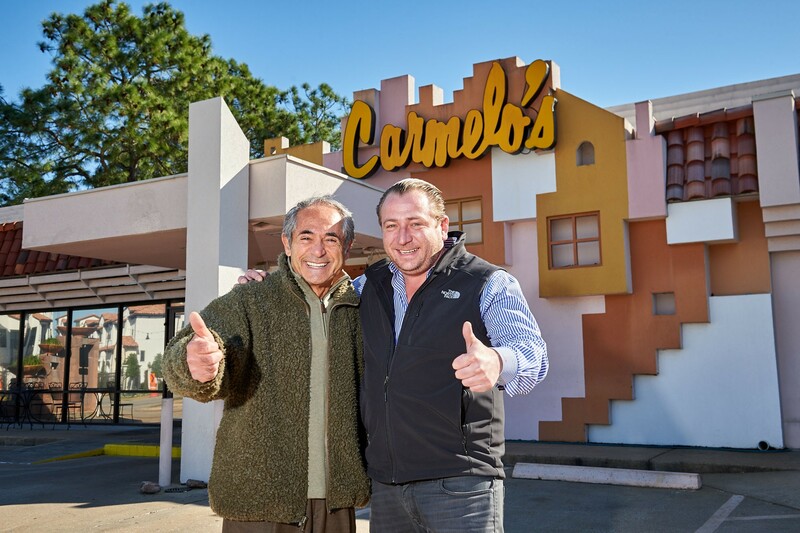 Carmelo's founder Carmelo Mauro (left) handed over the keys of his Memorial restaurant to Benjamin Berg (right). Photo by Jereme Brown. Welcome to 2018, a year that’s starting off with a bang in the Bayou City (as if we’d expect any less). This week, a classic Houston restaurant has been saved from permanent closure, an acclaimed Indian eatery is opening a satellite café and a restaurant group in the process of building out three new places decided it can add a fourth. Finally, a Neapolitan pizzeria is showing the love to teachers all year long. Addis Ababa, 7668 DeMoss: An announcement on the Ethiopian restaurant’s website earlier this month stated it is “indefinitely closed due to losses suffered from Hurricane Harvey.” Opened in 2013, it quickly became known for its hearty portions, welcoming atmosphere and lovely traditional coffee service. Carmelo’s 14745 Memorial: Founder Carmelo Mauro sold his eponymous Italian restaurant to B&B Butchers’ Benjamin Berg just before the end of 2017. The reincarnated Carmelo’s opened its doors on January 3 with the same menu and staff diners had come to love. “We are very excited to keep the Carmelo’s traditions and specialities alive while slowly and very thoughtfully making improvements over the next six months to the interior and the menu,” says Berg. His brother Daniel will join the operation as executive chef next month and add new dishes, including housemade pasta. Flo Paris Bakery and Cafe, 5407 Morningside and 5757 Westheimer: The casual cafe its third Houston location, an outpost on the Rice University campus, on January 8. Located in the all-glass Brochstein Pavilion, the new campus dining option offers coffees and pastries, as well as soups, sandwiches and salads. 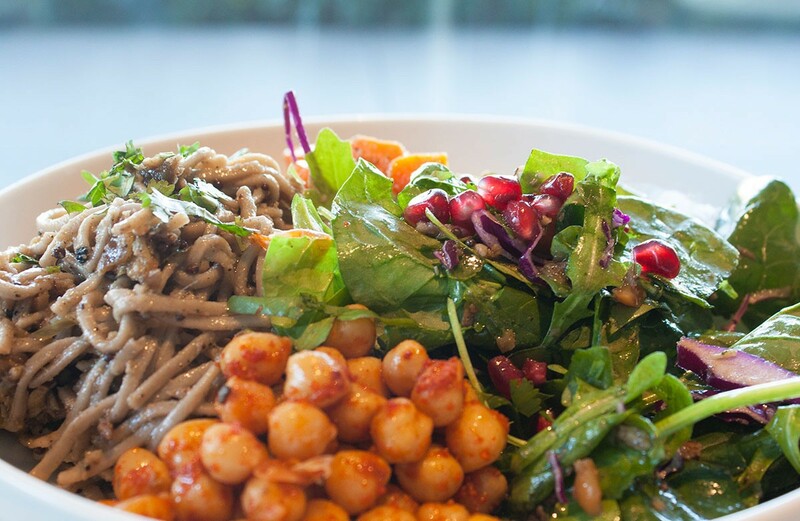 The Karala Noodle Salad, made with buckwheat noodles tossed with garbanzo beans, coconut, roasted carrots, spinach, lime and peanuts is available at Pondi Cafe at Asia Society Texas. Photo courtesy Pondí Café. Pondí Café, 1370 Southmore: Following a soft opening on December 1, this spinoff of popular Indian restaurant Pondicheri is fully operational in the Asia Society Texas facility in the Museum District. “I believe you should eat well and live spicy,” said Pondicheri chef Anita Jaisinghani in a press release announcing the opening. “Pondi and Asia Society are providing the opportunity to achieve both. I am thrilled to be serving lunch around some of the best cultural programming in Houston.” Open for lunch and light snacks, the menu features items such as chaat chips and chutney, butter chicken, kerala noodle salad and masala chai. The hours are Tuesday through Friday from 11 a.m. to 5 p.m. and Saturday and Sunday from 10 a.m. to 5 p.m. 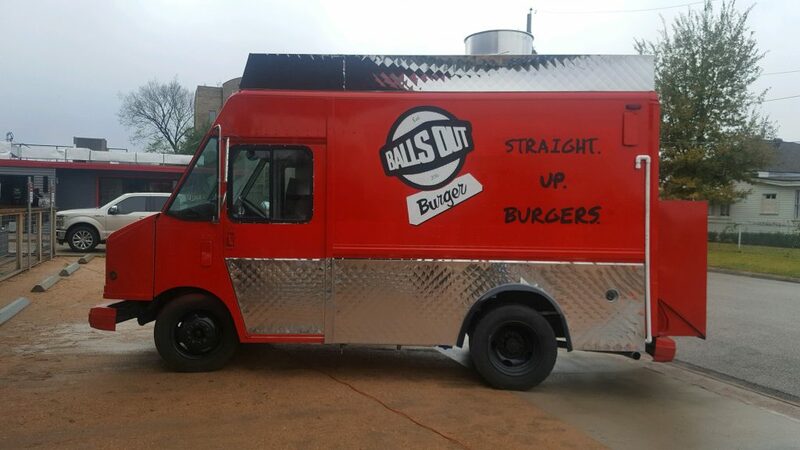 Balls Out Burger’s food truck should be rolling in Houston by the middle of the month. Photo courtesy of Balls Out Burger. Balls Out Burger, 1603 North Durham: The Heights burger joint is hitting the road with the launch of a food truck that should be on the streets in the next couple of weeks. It will serve up burgers, fries and milkshakes at parks and special events on the weekends and office buildings on weekdays. Those interested in charting its course can follow Balls Out on Facebook and Twitter. Executive Chef Jacob Pate and Julie Rogers will helm Agricole Hospitality’s Night Heron, slated to open in February. Photo by Carla Gomez. Night Heron 1601 West Main: Agricole Hospitality’s Ryan Pera, along with partners Morgan Weber and Vincent Huynh, are taking over the location formerly held by Lowbrow. Their forthcoming restaurant, Night Heron, features cuisine with South Asian and Caribbean influences and is expected to open sometime in February. 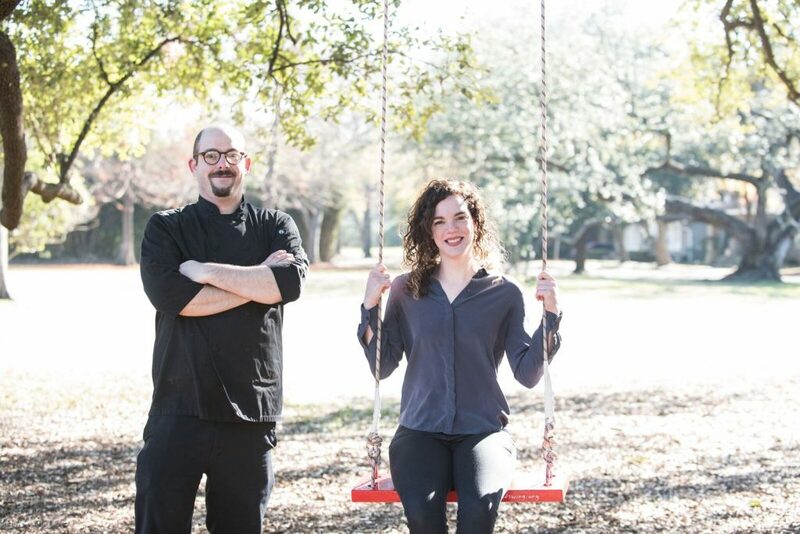 Jacob Pate (formerly of Nobie’s) is the executive chef; Julie Rogers is the general manager. Cane Rosso 1835 North Shepherd and 4306 Yoakum: Through Saturday, teachers and students can flash their school ID cards at either location and get 50-percent off a pizza. That’s one less dinner to make and might help ease getting back into the academic grind. Can’t make it this week? Cane Rosso will still honor a 15-percent teacher discount (with ID) through 2018. The Poinsettia (left) and Southern Snow are on State of Grace’s winter cocktail menu. Photo courtesy State of Grace. 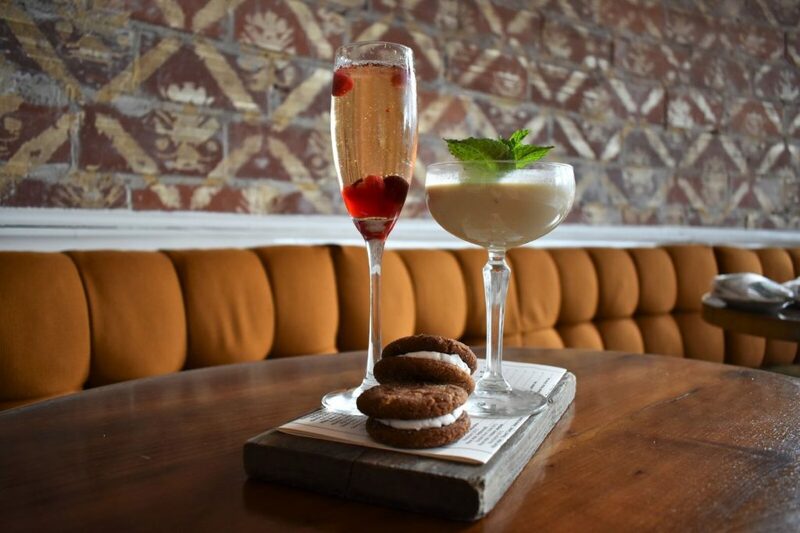 State of Grace, 3258 Westheimer: Anyone wishing that the holiday season could last just a little longer will celebrate State of Grace’s winter cocktail selections. Available through this month are the Poinsettia, a mix of orange and clove-infused vodka combined with cranberries and Cava; and the Southern Snow, combining espresso-infused rum, Fernet Branca, chai, vanilla, and cream. Hopdoddy Burger Bar, three locations: The burger joint kicks off 2018 with comfort food, offering the Meatloaf Burger special all month long. Made with Angus beef mixed with onion, mushrooms and “all the secrets Chef’s mom would share with us,” the homestyle burger is topped with caramelized onions and served with ketchup made with cane sugar. Rainbow Lodge, 2011 Ella: The popular Shady Acres restaurant, known for its wild game, has what sounds to be a killer meal deal. Every Sunday after 5 p.m., diners can enjoy a $15 dish designed by executive chef Mark Schmidt, along with half-price wines by the glass. The comfort food plates might include chicken piccata or garlic pork loin. Hugo’s, 1600 Westheimer: James Beard Award-winning chef Hugo Ortega has teamed up with Brock Wagner of Saint Arnold Brewing Company to create a special brew for the Icon series. It features Hugo’s housemade Mexican chocolate and there is a happy hour 5:30 to 7 p.m. to mark the release. Also on the menu: additional Saint Arnold’s favorites, beer cocktails by sommelier Sean Beck and Mexican street foods. Both Wagner and Ortega will be on hand to greet guests. The cost is $25 per person. To reserve, call (713) 524-7744. Plonk Bistro and Wine Bar, 1214 West 43rd: The Garden Oaks wine bar is hosting a pop-up with Feges BBQ. On the menu will be Gochujang St. Louis ribs with cucumber salad, smoked meatloaf with garlic mashed potatoes and brisket burnt ends with dirty rice. All plates are $10 and will be served from 2 to 7 p.m.
Houston Marathon Watch Party at Urban Eats, 3414 Washington: “Everyone had such a great time cheering on the runners from our patio last year, that we decided to open early this year,” says culinary director and owner Levi Rollins. Urban Eats will start serving artisan breakfast sandwiches, pastries and coffee (with free refills) at 7 a.m. Regular brunch service begins at 10 a.m.
Mark National Hot Pastrami Sandwich Day with this mouthful from Kenny and Ziggy’s. Photo courtesy of Kenny and Ziggy’s. National Hot Pastrami Day at Kenny & Ziggy’s New York Delicatessen, 2327 Post Oak and 5172 Buffalo Speedway: Both Kenny & Ziggy’s locations are celebrating by offering the restaurant’s Ultimate Hot Pastrami Sandwich for $21.95. 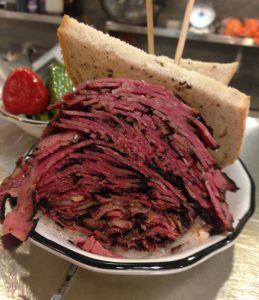 The mega-mouthful is 24 ounces of pastrami piled high on rye. Western Movie Night At Eight Row Flint, 1039 Yale: The Heights cocktail spot continues its “Eight Row Flick” month, showing a different Western every Monday evening. The feature this night is Hondo, with John Wayne starring as an Army dispatch rider who protects Geraldine Paige and her son from warring Apaches. There’s complimentary popcorn and $3 pints of Negative Space and Lame Duck from 11 Below Brewery. Wild Turkey Dinner at Pax Americana, 4319 Montrose: The five dinner courses will all be paired with bourbons from the popular brand. Selections include tomato-braised, prosciutto-wrapped dates with goat cheese paired with a Wild Turkey Rye Manhattan and Portuguese octopus, paprika broth and smoked potatoes paired with Russell’s Reserve 6-Year Single Barrel Rye. The cost is $75 per person. For reservations call (713) 239-0228.